KNOXVILLE, TN--(Marketwired - May 14, 2014) - Miller Energy Resources, Inc. ("Miller" or "the Company") (NYSE: MILL) today announced that the Company has signed a binding agreement to acquire Savant Alaska, LLC ("Savant"), subject to due diligence and regulatory approval, for $9.0 million in cash. Savant would become a wholly-owned subsidiary of Miller. Through Savant, Miller would own a 67.5% working interest in the Badami Unit, with ASRC Exploration, LLC ("AELLC") remaining as a 32.5% working interest partner. Miller would also obtain a 100% working interest in nearby exploration leases. These assets would bring approximately 1,100 BOPD gross and 600 BOPD net of current production and ownership of midstream assets located in the Alaska North Slope with a design capacity of 38,500 BOPD and 25 miles of pipeline. We estimate the acquisition will add approximately $6 million of PDP PV-10 (based on internal assessments by Savant) with significant additional drilling opportunities. In addition to the assets, Miller is pleased to welcome the Savant team, which will be supported by the Company's Anchorage office. Initial plans are to drill two sidetrack wells at an estimated cost of approximately $15 million per well ($10.1 million net to the Company's working interest). 12" oil pipeline and a 6" gas pipeline, both running 25 miles in length from Badami to the Endicott Pipeline. The oil pipeline is rated approximately for 70,000 BOPD capacity (subject to an operational reversion provision through 2016). "The acquisition of Savant will significantly expand Miller Energy's Alaskan asset ownership, complementing our existing Cook Inlet operations and providing us with additional wellbore diversification," said Scott M. Boruff, Miller's CEO. "This transaction increases our profile in the Alaskan oil and gas community, and gives us a credible foothold in the world-class North Slope resource play, including existing production, a developmental runway and substantial mid-stream assets. By utilizing our combined team's expertise and experience, we expect to significantly enhance the value of these assets. This transaction is another example of our ability to identify and acquire assets with substantial upside that Miller can unlock, providing a clear path to increased shareholder value." Savant Alaska, LLC was founded in 2006 for the purpose of direct investment in oil and gas exploration, exploitation and acquisition opportunities on the North Slope of Alaska. Savant presently has over 24,000 acres of developed and undeveloped leases, licensed over 190 square miles of 3-D seismic data, and is the operator of the Badami Unit located east of the Prudhoe Bay Field complex. In early 2010, Savant drilled the B1-38 exploration well from the Badami gravel pad to a depth of 15,245 feet. The well was completed as a discovery in the Killian sand section in preparation for production startup in the fall of 2010. Additionally, Savant drilled and completed the first horizontal development well, the B1-18A well, in the Badami field. Savant's initial Badami Unit exploration and development led to a facility restart in November 2010. Gross production from the unit has since surpassed 1.55 million barrels and gross revenue has since exceeded $150 million through March 2014. The Badami Unit is the only underutilized process train on the North Slope. Equally important, BP retains decommissioning liability for the plant, facilities, Class 1 disposal well and pipelines. The Badami Unit and field are located on the North Slope of Alaska, between the Endicott field and the Pt. Thomson Unit, approximately 32 miles east of Deadhorse and the beginning of the Trans-Alaska Pipeline System (TAPS). The Unit consists of seven State of Alaska leases. Savant owns a 67.5% interest in each of these leases and has approximately 17,200 gross acres within the Unit. AELLC, a wholly owned subsidiary of the Arctic Slope Regional Corporation, a large Alaska Native corporation, owns the remaining 32.5% working interest in this acreage. The Badami Unit has eight producing wells with a current production rate of approximately 1,100 BOPD gross and 600 BOPD net and an expected decline rate of 20% annually. Beginning in 1998, BP funded initial costs of field construction and development of approximately $300 million, gross. 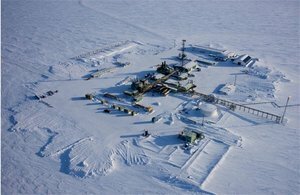 Savant succeeded BP as operator of the Badami Unit on January 7, 2012, making Savant the 4th integrated production operator on the North Slope of Alaska. Savant returned two wells to production via rig work overs in March 2012. There are several prospective horizons within the current Badami Unit, in addition to exploration prospects under lease by Savant to the east. Two near term planned wells in the Badami Unit -- the B1-14 and B1-28 -- have been identified as potential sidetrack candidates. 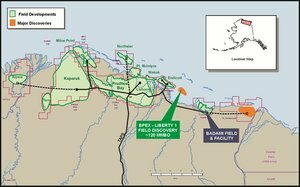 The anticipated recoverable reserves for B1-14 and B1-28 are approximately 2 MMBO with an estimated gross CAPEX of $15 million per well gross cost ($10.1 million net to the Company's working interest).